We’ve all felt occasional pangs of shyness and self-consciousness, but for the 15 million Americans with social anxiety disorder, the fear of being scrutinized and criticized can reach disabling proportions. Such was the case for Emily Ford, who shares her firsthand experiences in these pages. Emily’s true story of fear, struggle, and ultimate triumph is sure to resonate with other socially anxious teenagers and young adults. Emily’s frank, often witty, sometimes poignant account of how she negotiated all the obstacles of social anxiety–and eventually overcame them with the help of therapy and hard work–makes for compelling reading. Yet this book is more than just a memoir. Emily’s story is coupled with the latest medical and scientific information about the causes, diagnosis, treatment, and self-management of social anxiety disorder (or SAD). Readers will find a wealth of solid advice and genuine inspiration here. In engaging, accessible language–and with the help of psychiatrist Michael Liebowitz–she discusses what is known and not known about social anxiety disorder in adolescents. She outlines the various psychotherapies available for those with SAD and explains how to seek professional help, how to talk to family and friends about the illness, and how to handle difficult social situations. The result is both an absorbing story and a useful guide that will help to ease the isolation caused by SAD, encouraging young people to believe that, with commitment and hard work, they can overcome this illness. 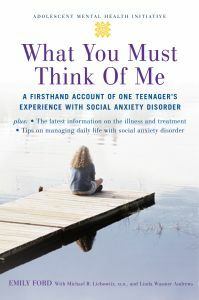 Part of the Adolescent Mental Health Initiative series of books written specifically for teens and young adults, What You Must Think of Me will also be a valuable resource for friends and family of those with SAD. It offers much-needed hope to young people, helping them to overcome this illness and lead healthy, productive lives. Emily Ford grew up in a rural farming community in the most northern regions of New York State. She has a Master's Degree in Secondary English Education and is involved in mental health consumer advocacy. She lives in Washington, DC with her dog Zsa Zsa. Michael Liebowitz, M.D. is Professor of Clinical Psychiatry at Columbia University. He is also the author of Chemistry of Love and Social Phobia: Diagnosis, Assessment, and Treatment. Linda Wasmer Andrews is a freelance science writer. Her books include If Your Adolescent Has Depression or Bipolar Disorder: An Essential Resource for Parents, with Dwight Evans (OUP 2005), and If Your Adolescent Has an Anxiety Disorder: An Essential Resource for Parents, with Edna Foa (OUP, 2006).